Sustainably Savvy > What's in My Hair Products > Herbal Essences Bio:Renew | Are they Greenwashing? 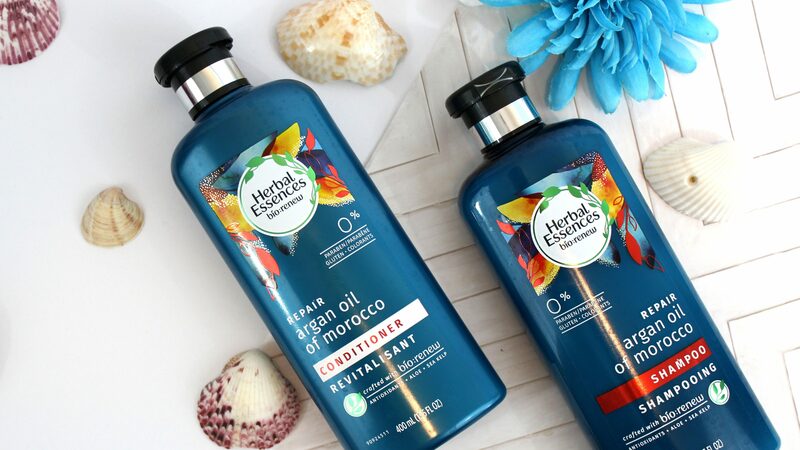 The new Herbal Essences Bio:Renew collection has launched and it sounds like a pretty good option for those who want to use more green and natural products. Marketed with Bio:Renew; a mix of antioxidants, sea kelp and aloe it is bound to leave your locks feeling luscious and hydrated. Unfortunately, once you dive into the ingredients of the Bio:Renew collection… you really don’t see much of a change in their chemistry. So what is the Herbal Essences Bio:Renew collection all about? 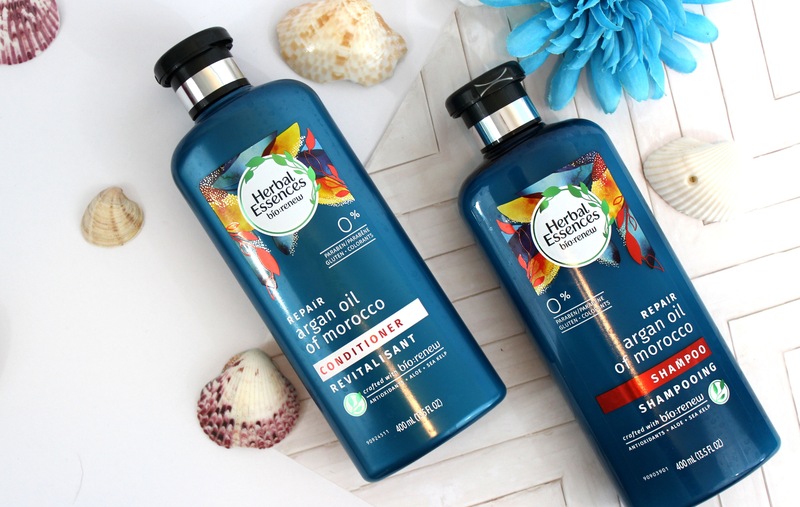 The Herbal Essences Bio:Renew collection includes the following scents: Coconut Milk, Argan Oil of Morroco, Arabica Coffee and White Grapefruit & Mosa Mint. I received the Argan Oil of Morroco Shampoo + Conditioner and the Cucumber + Green Tea Dry Shampoo free from Bzzagent. However, I am only going to talk about the Shampoo + Conditioner in this post. This will probably be the last item I receive from Bzzagent because I’m not going to be saying a whole lot of positive things about it. Although I do have to make a kudos to Herbal Essences for listing their ingredients on the website with a clickable link to why each ingredient is added to the product. I just think the selection of ingredients needs to be curated better and a better description about each chemical needs to be provided. But hey, at least they are on their way to being more transparent! 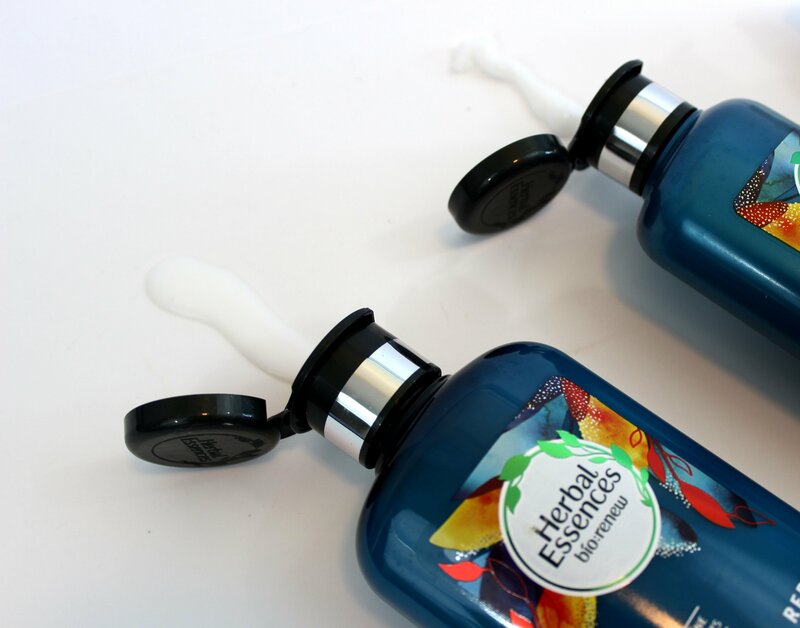 Today I’m going to talk about why I think that Herbal Essences is one of those brands that markets in a clever way to make it seem like they aren’t Greenwashing… but how they can seem like a more natural and green choice. When you first start out on your green beauty journey, you’re likely to encounter some brands that you might think are green + organic but aren’t. Unfortunately it is all too common for brands to claim that they are natural + green when they are far from. As there is essentially no measure set in place to say that companies cannot. When companies make the claim that they are natural, organic or environmentally-friendly but it isn’t true it is called Greenwashing. Bio:Renew seems to be a fancy description to say that the ingredients have a signature mixture of natural products which are beneficial to your hair. It’s hard to really say whether the bio:renew blend is actually beneficial because there is absolutely no literature on it, nor studies that Herbal Essences seems to reference. It is a bold claim that throwing a few natural products together can really benefit your hair… when you’re just stripping it away with SLS + SLES at the same time, no? So let’s take a look at the ingredient lists from the Argan Oil of Morocco Shampoo + Conditioner, shall we? The colour coding is based on EWG Skin Deep from their 1-10 rating system. 1-3 is green, 4-6 is orange, 7-10 is red. The higher the number, the more you want to avoid it. SODIUM LAURYL SULFATE. Used as a surfactant. Could be an eye & skin irritant. It is toxic to aquatic organisms. SODIUM LAURETH SULFATE. Used as a surfactant. Could be an eye & skin irritant. It is toxic to aquatic organisms. Health Canada has flagged it as a moderate human health priority. COCAMIDOPROPYL BETAINE. Used as a surfactant. Could be an eye & skin irritant. Suspected to be an environmental toxin too. DIMETHICONE. A silicon based polymer which is used to condition and moisturize. FRAGRANCE/PARFUM. Used to scent the product, no idea what is within it. ARGANIA SPINOSA KERNEL OIL. Argan Kernel oil derived from the African Argania Spinosa tree. Used as a moisturizer and conditioner. HISTIDINE. An amino acid, used as a hair conditioner. ALOE BARBADENSIS LEAF JUICE. Aloe Vera gel, used as a moisturizer. ECKLONIA RADIATA EXTRACT. Australian Sea Kelp Extract, used as a conditioner + antioxidant. COCAMIDE MEA. Derived synthetically from Coconut oils, used to help foaming and cleaning. SODIUM XYLENESULFONATE. A sodium salt used to help product consistency according to Herbal Essences. SODIUM CHLORIDE. Inorganic salt (table salt) used to help product consistency. GUAR HYDROXYPROPYLTRIMONIUM CHLORIDE. Used for hair conditioning. POLYQUATERNIUM-6. Used to condition hair – limited data available. METHYLCHLOROISOTHIAZOLINONE. Preservative commonly linked to allergic reactions. METHYLISOTHIAZOLINONE. Preservative. High concentrations could be neurotoxic. STEARYL ALCOHOL. A naturally occurring fatty acid used for conditioning. BEHENTRIMONIUM METHOSULFATE. Used as a surfactant/ cleanser. Data on this ingredient is limited. BIS-AMINOPROPYL DIMETHICONE. Used as a conditioning agent, no data listed. CETYL ALCOHOL. Used to moisturize hair. BENZYL ALCOHOL. Used as a preservative. DICETYLDIMONIUM CHLORIDE. Used as a surfactant. Has limited data. DISODIUM EDTA. Used as a preservative. So the ingredients aren’t that bad… are they? Although not many of the ingredients rate highly on the EWG Skin Deep website (which is good.) These aren’t Eco Certified ingredients. 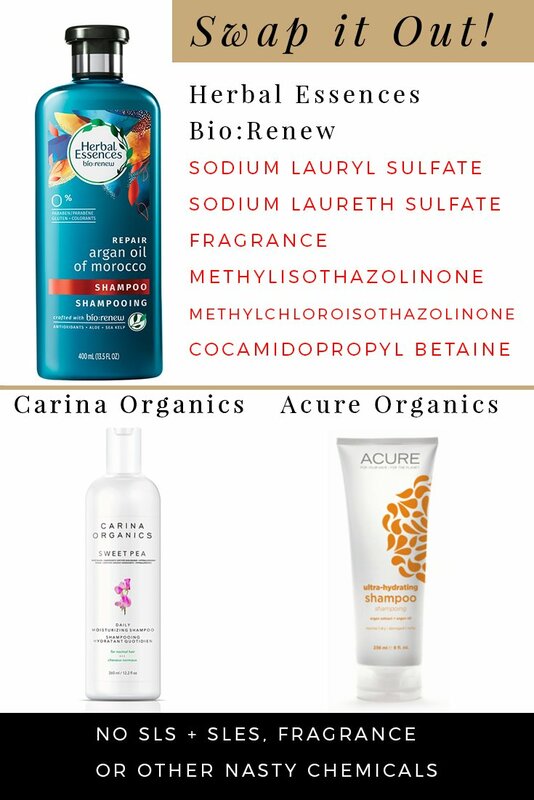 Herbal Essences lists the Argan Oil, Histidine, Aloe Vera and the Sea Kelp in green on their ingredient list but there is no green certification to back up whether it was sourced sustainably. In fairness, they don’t market their products as being completely green or natural, but I do believe it is misleading to state that there is a green aspect behind it. On the bottle, beside the crafted with Bio:Renew title they add a little graphic with leaves. This could lead customers to believe that they are buying a green product as it looks fairly similar to other eco certifications. My real question is, how can the lovely bio:renew aspect really be absorbed into the hair when the shampoo has three different surfactants with a higher concentration than any of the bio:renew ingredients? I cannot see how the bio:renew part of the shampoo is really very useful in this instance. Luckily, for the conditioner there is only one surfactant that comes before the bio:renew ingredients making it much more likely to benefit your hair. Does the Herbal Essences Bio:Renew Collection work? Personally I try to avoid SLS + SLES in my shampoo and conditioner as much as possible because they have been linked to skin irritation – and after testing this product I can verify that it made my scalp very dry and itchy. (This was before I read the ingredients, I wanted to give an unbiased opinion of the way the products work.) I usually use the Carina Organics collection which have no SLS + SLES within them. I have not had a problem with any dandruff… until I tried this. Over all, the shampoo cleaned very well. There is no doubt about that, but I honestly cannot say that my hair felt more soft. I believe that Herbal Essences is heading in the right direction with the transparency to say why chemicals are used in their products, but I don’t think that their marketing techniques are very honest. What is your stance on Greenwashing? Do you believe that Herbal Essences is Greenwashing?